More than 36,000 people attend three-day convention in Karlsruhe. The World Head of the Ahmadiyya Muslim Community, the Fifth Khalifa, His Holiness, Hazrat Mirza Masroor Ahmad concluded the 40th Annual Convention (Jalsa Salana) of the Ahmadiyya Muslim Community in Germany on 7 June 2015 with an inspirational address regarding the importance of spreading the true peaceful message of Islam to all parts of the world. 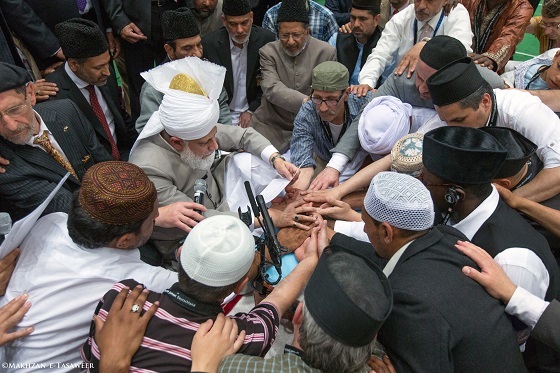 Prior to the session, His Holiness also led more than 36,000 Ahmadi Muslims in a pledge of allegiance (Bai’at) ceremony. During his address, His Holiness said the Ahmadiyya Muslim Community was now far better known across Germany, among both the general population and its leaders, as compared to just a few years ago. For example, the community was now officially recognised as an authority on Islam in Hesse State. His Holiness said this was a direct result of divine support and help. Hazrat Mirza Masroor Ahmad said it was the duty of every single Ahmadi Muslim to spread the true and peaceful message of Islam. His Holiness said that Ahmadi Muslims would never use force but would always seek to persuade others with love and reason alone. His Holiness said the Holy Prophet (peace be upon him) taught that a person should desire for others what they preferred for themselves and it was with this spirit that Ahmadi Muslims sought to propagate the message of true Islam. Hazrat Mirza Masroor Ahmad said that Holy Quran states that the propagation of Islam should be conducted with wisdom. Thus, all preachers should seek to persuade others with logic and courtesy and should inculcate patience and empathy into their character. The Khalifa said that to spread the message of Islam it was essential that a person himself should set the highest moral standards and be an example for others to follow. His Holiness said that if an alcoholic were to preach sobriety or an adulterer was to preach chastity then no one would take their counsel seriously. In the same way it would be hypocritical for an immoral person to seek to guide others towards morality. 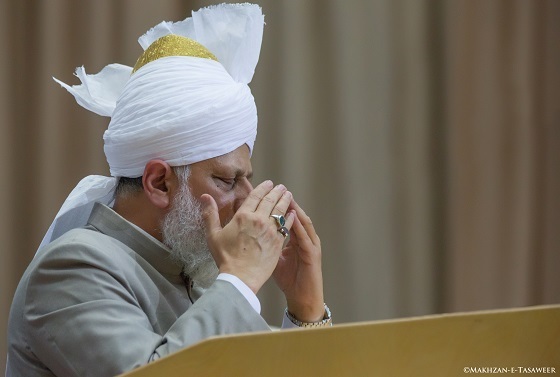 Hazrat Mirza Masroor Ahmad concluded by praying that all Ahmadi Muslims became true ambassadors of the true message of Islam so that the entire world came to acknowledge Islam’s beauty and virtue. Earlier in the day, over 36,000 Ahmadi Muslims attending the event in Karlsruhe took part in an emotional pledge of allegiance (Bai’at) at the hand of the Khalifa, while Ahmadi Muslims around the world also took part through viewing the proceedings live on MTA International. In the ceremony, a number of people took the pledge for the very first time. Share the post "Jalsa Salana Germany 2015 Concludes with Faith-Inspiring Address by Head of the Ahmadiyya Muslim Community‏"